WORLD’S fastest LAMP and RT-LAMP enzyme. OptiGene’s engineered DNA polymerase for the fastest isothermal amplification of DNA and RNA. Contains our proprietary novel thermostable GspSSD LF DNA Polymerase; further engineered through in-silico design. Native reverse-transcriptase activity enables rapid single enzyme RT-LAMP. Fastest amplification of DNA and RNA. (0.8µM FIP 5’-CTGTTGCACCTACCCTTCTGGAGCAGGAGAG GGAAATATCA-3’, 0.8µM BIP 5’-GAAGTCAAGCAAGAGAAGACCT GAAAACTCCTGACCTCAAGTGA-3’, 0.2µM F3 5’-ACCATTATTCTGTCTACCACAC-3’, 0.2µM B3 5’-GACAGGGTTTCACCATGTT-3’, 0.4µM LoopF 5’-TCTCTTCCTCTGGCGTCT-3’, 0.4µM LoopB 5’-CTCACGCCTATAATCCTAGCATT-3’), 3.75ng fluorescent intercalating dye (V13-01184 Dyomics GmbH). ‘GspSSD2.0’, ‘N’ and ‘L’ reactions were run as per manufacturer’s instructions at 65ºC, 65ºC and 70ºC respectively on a Genie®II. A: Real-time amplification plots. B: Time-to-threshold values (the maximal rate of change in fluorescence over time) reported in graphical format for simple comparison. (0.8µM FIP 5’-TCGCAAGCGAACCATCTACGTCCGTTGGTATAGACCTGAA-3’, 0.8µM BIP 5’-CGATAGACTTATCGTCTGCATCCGGAGATATGAATATAGCTCTGGTGG-3’, 0.2µM F3 5’-TGTAAGGAGCCTGATATGAATATG-3’, 0.2µM B3- TAGTGTGAGCGGATACGAT-3’, 0.4µM LoopF 5’-GCCAGACGCTGGTTGAT-3’, 0.4µM LoopB 5’-GATCGCCTGGTGTGGAG-3’), 3.75ng fluorescent intercalating dye (V13-01184 Dyomics GmbH). 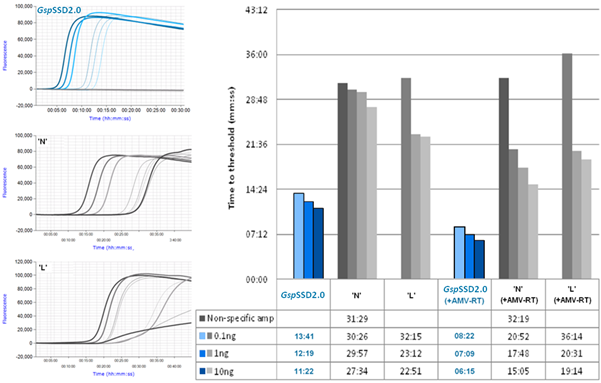 ‘GspSSD2.0’, ‘N’ and ‘L’ reactions were run as per manufacturer’s instructions at 65ºC, 65ºC and 70ºC respectively on a Genie®II +/- 0.5U AMV-RT (OptiGene). A: Real-time amplification plots. 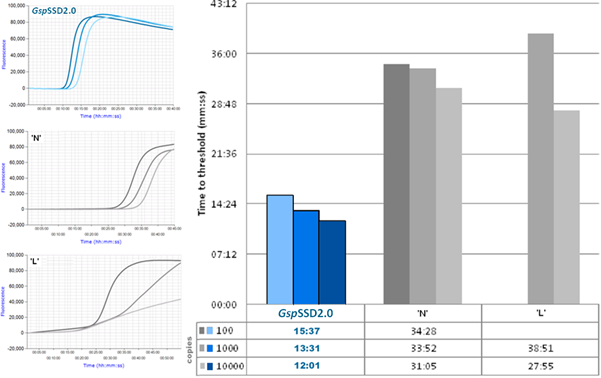 B: Time-to-threshold values (the maximal rate of change in fluorescence over time) reported in graphical format for simple comparison.